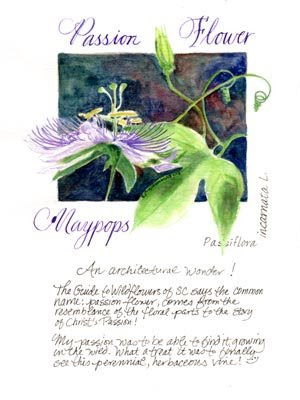 At long last, I've finished my journal page devoted to the Passion Flower, aka Maypops! I wish everyone could view this flower in real time. I've never seen such an, for a lack of a better term..... architectural wonder! When we moved here, I purchased a SC wildflower guide book. 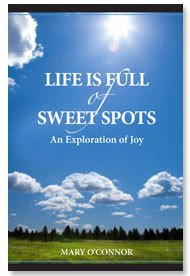 I perused through to see what goodies I might find in my neck of the low country. Maypops made the top of my list to see. If not for a brief glance to my right as I was leaving my favorite Oldfield trail, I may have surely missed it! The flowers only last for three days! Two days later, I took Rob over to show him this gem of the wildflower world.......... Not a bloom in sight! Three times I tried to have him see them. Oh well, I did get one more view. I slipped in a quick visit to the trail and lucked out :) This time I saw green fruit, which was large and round. My wildflower book by Richard D. Porcher and Douglas A Rayner says that the fruit is edible raw but, even better when made into jelly. Yum! The flowers will bloom May through September (thus the Maypops name?) and the fruit will yellow when ripe (June through October). The common name; passion-flower comes from the resemblance of the floral parts to the story of Christ's Passion. You have a beautiful nature journal!